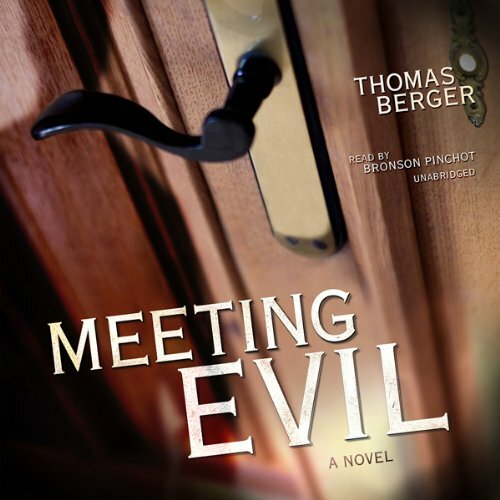 Meeting Evil tells an adrenaline-pumped, genuinely frightening tale of malevolence that swerves swiftly and irrevocably to a catastrophic climax. John Felton meets evil late one Monday morning when the doorbell rings. Standing on the front porch is a stranger. He wears expensive running shoes and a baseball cap and calls himself Richie. He tells John his car has stalled and asks for help. An altercation at the gas station leads to a shocking crime as violence begets violence. At the end of this harrowing day, John returns home to find Richie ensconced in his living room, chatting up his wife. The evil has somehow seeped into his life. Thus begins the transformation of an unremarkable husband and father of two into a desperate man willing to go to any length to protect his family from the darkness that threatens them. This is an extraordinary masterpiece and a chilling portrait of mounting menace played out against an everyday world of domestic routine, personified in a protagonist of basic decency grappling with both the immediate and existential meaning of true evil. ©1992 Thomas Berger (P)2011 Blackstone Audio, Inc. The introduction by Jonathan Lethem, whom I think of as one of the best living writers we have, sold me on the book, and it's arguably the most interesting part of what's here. Lethem talks about how gifted Berger is, and I tried to use those insights to keep my interest in the novel. Still, I listened throughout, waiting for some of the surprise in plot or narrative form that I love in Lethem, and I found what felt a predictable and sometimes heavy-handed work. Would you ever listen to anything by Thomas Berger again? Maybe, but it would have to be something earlier from the Little Big Man era. Could you see Meeting Evil being made into a movie or a TV series? Who should the stars be? It's going to be, or so I thought. For me Pinchot's reading seems to embody Berger's exciting mix of character development and suspense in clear language. I loved listening to this book. The plot development is straight forward as a stable citizen tries to help a man who leads him through a shocking day that challenges his own values and self image. I'm hoping we will see more of Berger's titles in Audible.com soon. One note: The first chapter of the download is Jonathan Lethem's interesting commentary on Berger's writing; the book starts with chapter 2.
thomas berger is one of my favourite writers, but this book is really making me want to give it short shrift. first of all, there's a rather poncy somebody taking up precious time by introducing berger and this book, which, in print, one would simply disregard and move on, but in the audio version, you're stuck with him. then berger comes on, and he must have been in some uninspired mood, there's another book just like this which somebody made into a massively unfunny movie, called "neighbours". so -- not every book by thomas berger is or was a classic. this particular title makes me doubt whether "teddy villanova" or "little big man" really were as great as i remember them? i think a massive collective reassessment is in order, and audible should put some effort into reviving or reanimating some of this author's other titles. with this one i'm sraining to be entertained.